WHAT'S IN MY BAG. SPRING EDITION. BECKI. | Life Looks Perfect. WHAT'S IN MY BAG. SPRING EDITION. BECKI. A *brand new* post for you today to take a sneaky peek inside my Spring handbag! We have always been intrigued in what people carry around with them, so we thought we should share what is always filling our handbags! We are just like many ladies who carry around with them lots of things that we don't really need but have to have. Consequently our backs now suffer! So here is inside my bag. 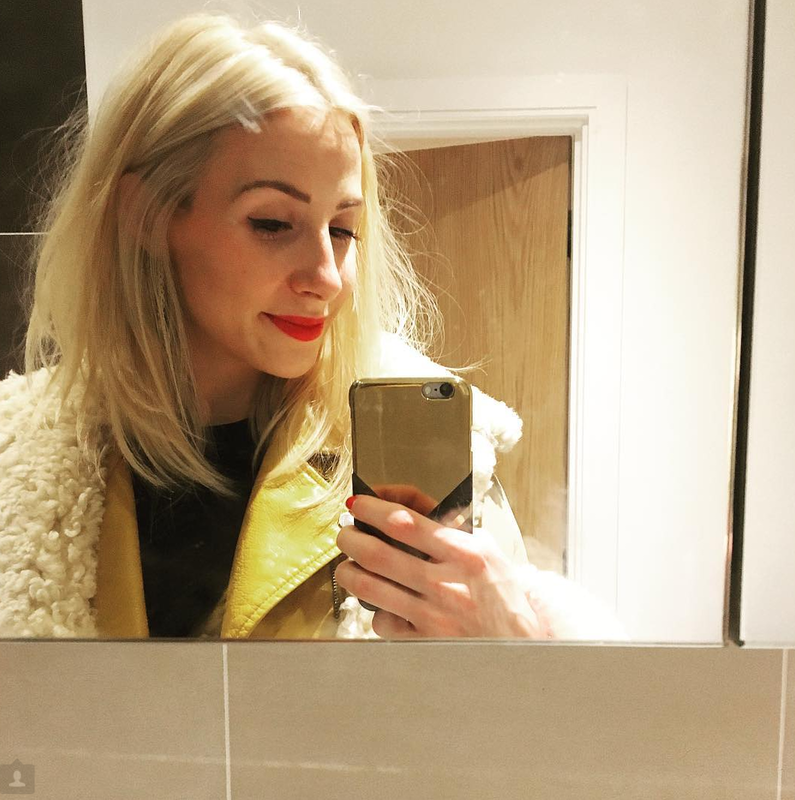 As a Londoner, i battle awful unpredictable weather, the dreaded sweaty tube and somehow manage to look like it is all effortless, as a lady should hehe. Inside my bag during the Spring, I always have the basics phone, purse (filled with far too many vouchers & pennies) oyster card, Extra gun, sunnies and my diary. I am afraid to admit, I am one of those people who come rain or shine, you will always find me in sunglasses! This means I have a ridiculous collection of sunnies in all shapes and sizes. Then my beauty must-haves are Elizabeth Arden's 8 hour cream (Review HERE), Rimmel Stay Matte Pressed Powder & Liz Earle's Powder Brush c/o (Review HERE & HERE), Chanel No 5 mini bottle, Lush Mint Julips Lip Scrub and a hand cream of some sort, this month Clarins Hand & Nail Treatment Cream. 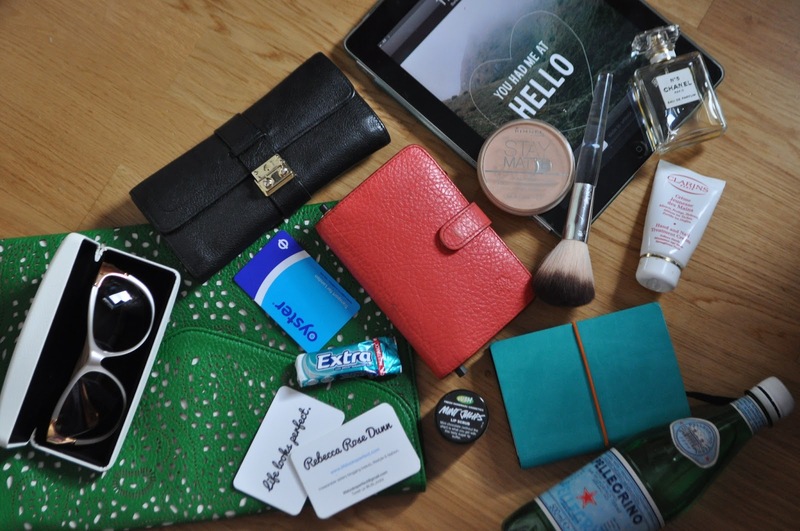 My added extras that are always in my bag are a bottle of San Pellegrino sparkling water, a notepad & pen and sometimes my I-pad. As much as I love having my I-pad on the go, I am much more of a pen and paper gal so seems silly to take them both around with me. Did I mention that my bag normally breaks my back! Oh and last but not least, I always make sure I have my Life Looks Perfect business cards! You just never know who you could meet out and about! Jess and I designed our own and ordered them from Moo.com, which is a fantastic company that although may seem expensive, the quality is faultless and we couldn't be happier with how they turned out. 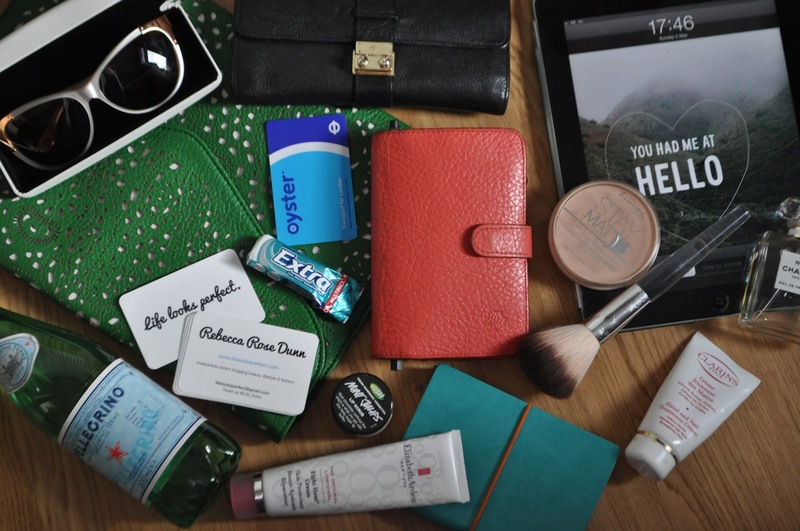 Hope you have enjoyed our new post and sneaking a peek inside my Spring handbag! Bag- Tk Maxx £15.00, Sunglasses- Micheal Kors found in Tk Maxx £20.00, Notepad- Paperchase £8.00, Diary- Mulberry (Gift) & Purse- Mulberry found on Ebay £110.00. Love the sunnies, I never think to look in TK Maxx! I'm an everything plus the kitchen sink kinda gal too! 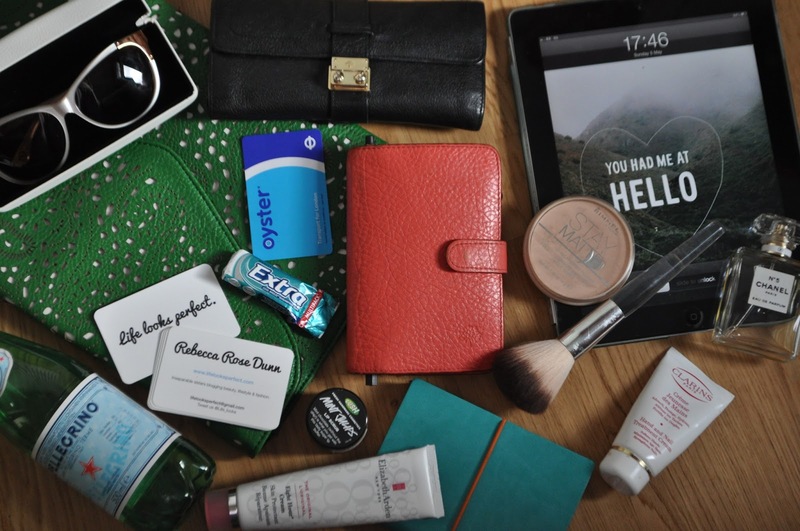 I love reading 'what's in my bag' posts. I'm so nebby when it comes to seeing what people carry round with them. :) Nice post.